Designing a tiny home requires careful consideration of how people live in their space and an equal amount of attention to design and aesthetic detail. It’s imperative to have a balance of style and function because homeowners desire both. That’s why Simple Life continues to partner with the most reputable, experienced, and credible cottage builders to develop a catalogue of options for homebuyers so they may live a tiny home that provides them with exactly what they need. Simple Life is excited to announce our newest floorplan in The Hamlet, the Wedge. The Wedge appeals to those with an eye for clean lines and industrial accents. It’s sleek and stylish exterior is very on trend with current design inspiration. It features a distinct Galvalume monoslope roof that sets this exterior apart from many other designs in our Simple Life communities. The Wedge is a luxury model crafted by Clayton Homes and provides homeowners with 394 square feet of living space. It’s bold yet welcoming, tiny by design yet spacious in feel, compact and still extremely livable and comfortable. The Wedge provides a stylish king-sized bedroom just off a multi-function space where the washer and dryer are located. The bedroom includes a master closet with plenty of space for additional storage. The Clerestory Windows allow the perfect amount of sun exposure and for additional lighting; homebuyers have the option of including designer wall sconces above the two nightstands opposite the bed. The bathroom is full-sized with a glass door shower; wood vanity with storage and oil-rubbed bronze faucets and accents with an overall modern design inspiration to compliment the feel of the interior and exterior finishes of the home. 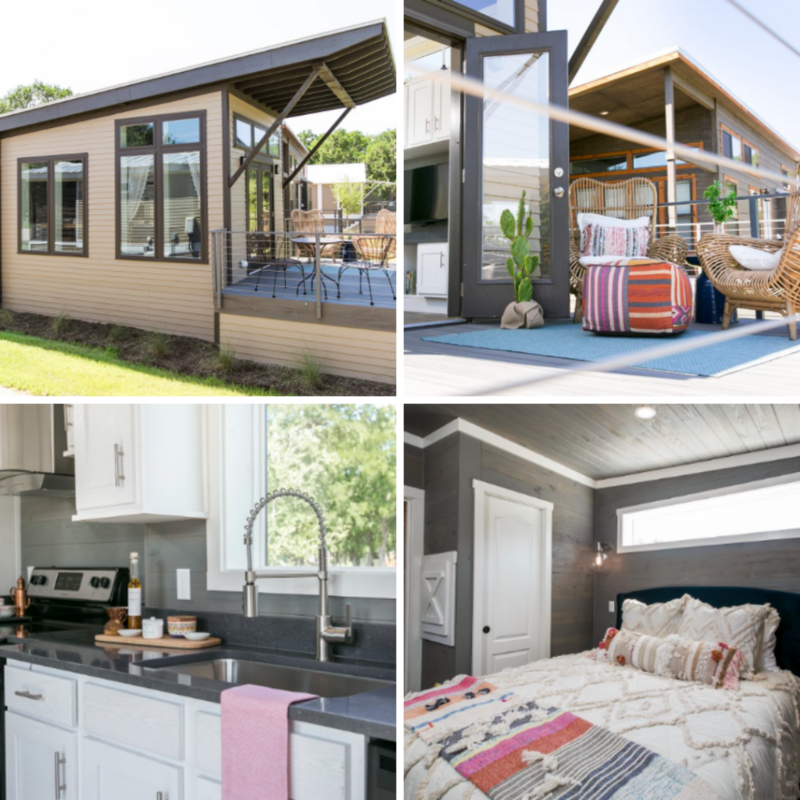 When asked how to describe The Wedge, our Simple Life team is quick to share it’s a “smart design with smart style.” This floorplan is just one more example of how living tiny doesn’t mean you have to live with less design and style. For more information about The Wedge or other floorplan options at The Hamlet, a Simple Life community located in Flat Rock, North Carolina contact please call (828) 290-9510 or click here to join our exclusive newsletter!